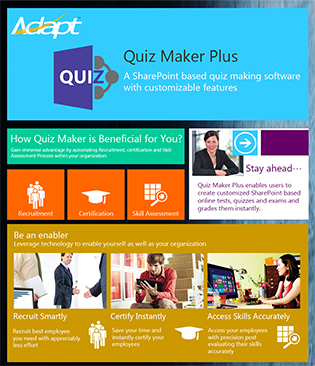 Quiz Maker Plus is an advanced, SharePoint based quiz maker with powerful customizable features, which help instructors and teachers to create online tests,quizzes and exams for employees or students. It is ideal for corporations, educational institutions or even users looking to create quizzes just to create a learning ambience. If you are looking for a test generator, exam creator software or a web based quiz maker then Quiz Maker is the most apt solution for your needs. In addition to this, our online exams software provides you detailed reports and statistics, which will help you analyze and understand the performance of learners better. Educational institutes can deploy Quiz Maker to enable their teachers to create interactive online examinations with instant results. Training companies can use this application to access participant´s knowledge after each training session and can use this for their certifications. User friendly interface that allows you to add and manage questions easily with Quiz Maker Plus. 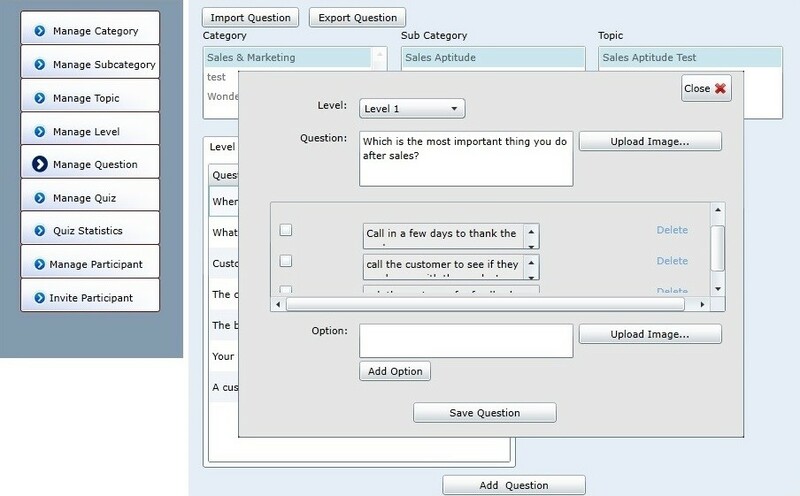 You can assign multiple choice options that can be text or a visual. If you already have content and questions, you can import them in Quiz Maker easily. You can customize each question according to the level of its difficulty, add image and also predefine the format of a question to decide whether it will contain an image or not. 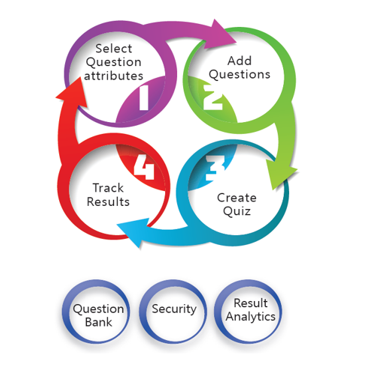 Once you have questions in your question bank, now it´s time to create and publish new quiz or online examination. 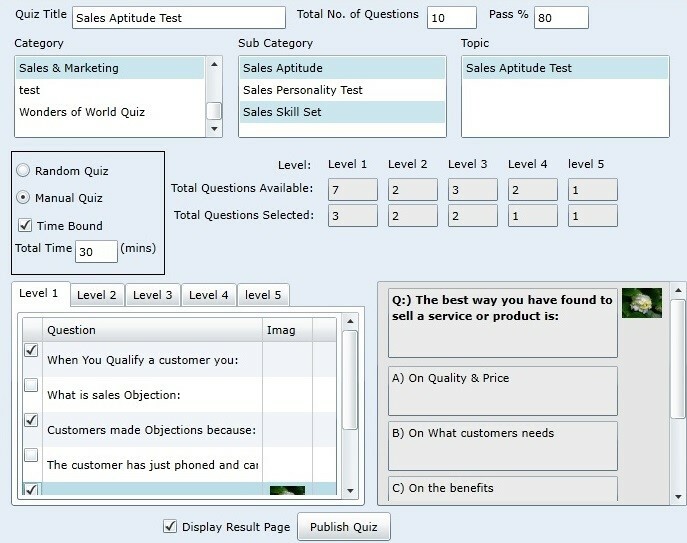 You can put the desired title of the quiz, choose total number of questions, setup time duration, define qualifying percentage, pickup questions for suitable levels and choose an option to publish this quiz either with pre-selected questions or random selection of questions. Your quiz can be created and published in no time. 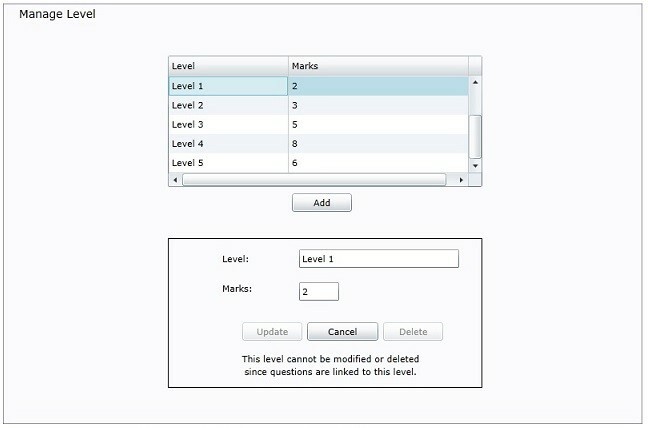 You can create various levels and assign them to questions. These could be levels of difficulty or skill based levels for any given question. At the time of adding new question to the question bank, you can assign an appropriate level to that particular question. This helps you to choose how may difficult or easy questions you want to publish in a quiz. Quiz supervisor gets an instant evaluation report with all the necessary statistics. You can view the overall result with Quiz Maker Plus to have a holistic view of the entire test. Assess the quantum of qualified, not qualified and success rate for individual quizzes. It represents you with an explicit break-up of the performance of the individual; exhibiting his core strengths and weaknesses. See total number of appearances for any given quiz, attempts, who has qualified and who has not. You can also export the entire details in excel. Server: Microsoft SharePoint 2013, SharePoint 2010, SharePoint Online (Office 365), SharePoint Foundation Server 2013, SharePoint Foundation Server 2010.